I had been meaning to get a tattoo ever since I had started college. I had a long break of about 5 months before college during which I spent a lot of time in libraries, and with the TV. I would read upon things that would catch my eye in some TV serial or movies. One of the things that I read about was tattoos. The idea of it still appeals to me. It is something of your own choice that stays on you forever. Yes, we can get them removed now but I didn’t know of it back then. A tattoo would be something that is not only of my choice but will have something that is unique to me. Back then I didn’t have enough money to get one as my most of my allowance would be spent on movies and internet. The cost of getting a tattoo done was relatively high as well. Back then a small time tattoo parlor would charge anything upwards of 600 INR per square inch, and my monthly allowance was 500 INR of which I wouldn’t save more than 100 by month’s end. I had kept some designs in my diary that I would like to use. I was tempted by Chinese characters due to some of the dubbed Chinese/Japanese kung fu / martial arts shows that would come on TV that I was a fan of. But since I can’t read the script, I gave up on the idea. Once I started working, I had enough money to get one done. I asked around for some parlors in my city and zeroed in on Relic Tattoos. After some discussion with him, I shared my design with him, and some fine tuning and discussions later we were ready to go. I was slightly worried about the amount of pain that would be a part of this. I made a note of pre-tattoo requirements he had told me. When we finally started, I was at ease because asked me to make a playlist of my favorite songs and I closed my eyes. There was a small sting that I initially felt, but I got curios and wanted to see first hand how it is done. It was only a second before I became oblivious to any pain. This is what I finally got. 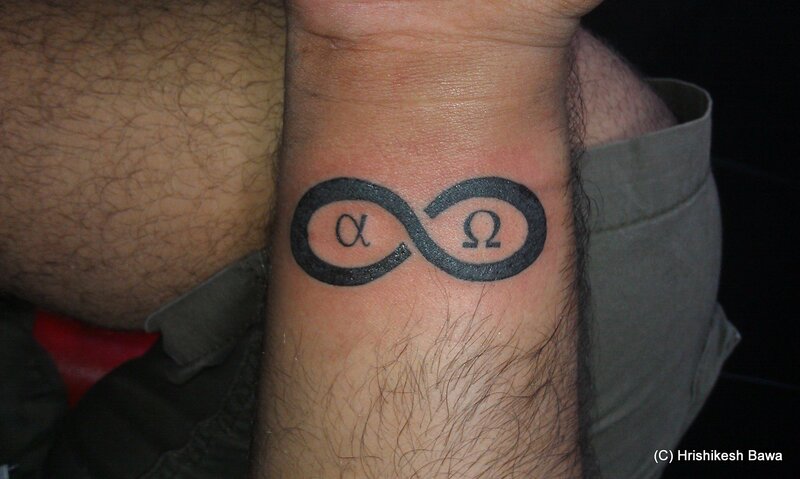 The idea behind this was to meld the symbols of Alpha, Omega and Infinity. If you read upon them, many religious texts about God will have a variation of “I am the beginning, I am the end”. This was my take upon this statement. Alpha and Omega have been used to signify the start and end, and infinity is used for the infinite and boundless. This tattoo on my wrist means to me that for all my work, actions and tasks, I am the person who controls when and how to start, and to end. The infinity is for the infinite potential I believe I have in me. I also want to get one based on the Harry Potter Series. The symbol in the center is that of the Deathly Hallows. The three symbols on the outside are for the Golden Trio of Harry, Ron and Hermione. 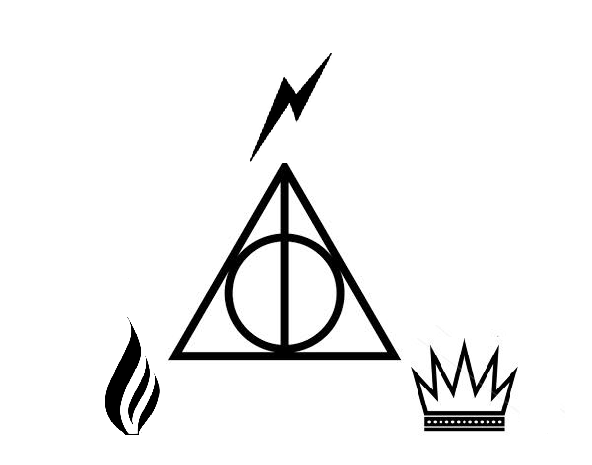 The Lightning symbol is for Harry (for his scar), the Crown for Ron (“Weasley is our King!” and for his ability at chess) and the Flame for Hermione (People use an electric bulb to signify that she is the brightest with of her age, but I used a flame symbol for the flames she easily conjures and as a witch it makes a better symbol than a bulb). This character would be on my left arm where the death eaters in the series have the Dark Mark tattooed. In the long run, if I get married and have kids then I will get a family tree tattooed on my chest which will the names of my parents, my wife, me and eventually kids. The image that I have in my mind is to have a landscape with my parents’ name in the soil, my wife and me as fruit bearing trees and the kids as birds in a nest.